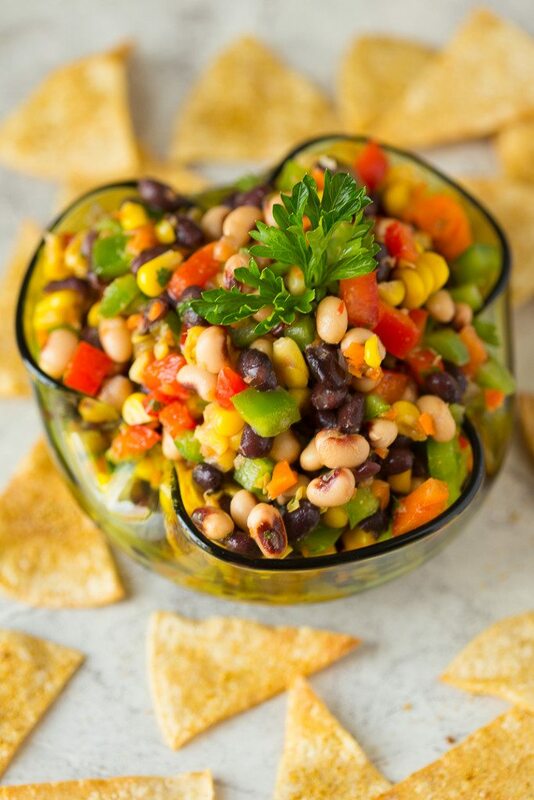 Crunchy, salty, savory and sweet, this Texas Caviar Black-eyed Pea Dip is an awesome healthy snack food that’s perfect for tailgating, football or superbowl parties, camping, and picnics! Behold the amazing black-eyed pea dip I told y’all about last week. 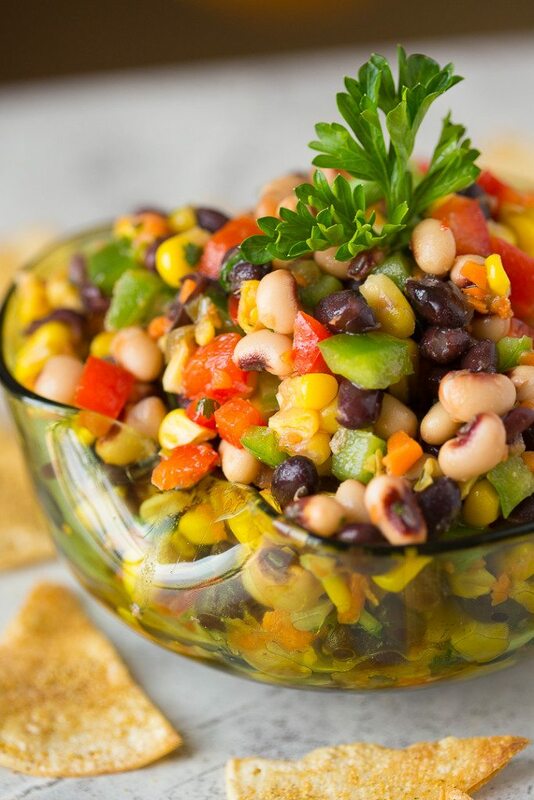 Loaded with fresh veggies, protein packed black-eyed peas, sweet corn cut off the cob, and a tangy red wine vinaigrette this awesome football food is sure to please even the pickiest of eaters. It’s also known as Texas caviar for some reason, but I honestly have no idea why. I am way too swamped with life at the moment to Google such things. Things are just cra-zay! The good news is we found a house to rent for a while so we can have some time to peruse local listings and save up some more moola for a down payment on our own home. It worked out perfectly because one of my besties and his wife just bought a home and were looking for a renter for their old one. They hadn’t found one yet and were going to have to pay a double mortgage until I posted on Facebook that were going to be looking for a place to rent. Long story short everything just fell into place, and we will be moving into our new home on December 1st! Or I will at least. Hopefully the hubs will have all of his prior obligations wrapped up by then. Enough about that. Let’s get to this recipe, shall we? 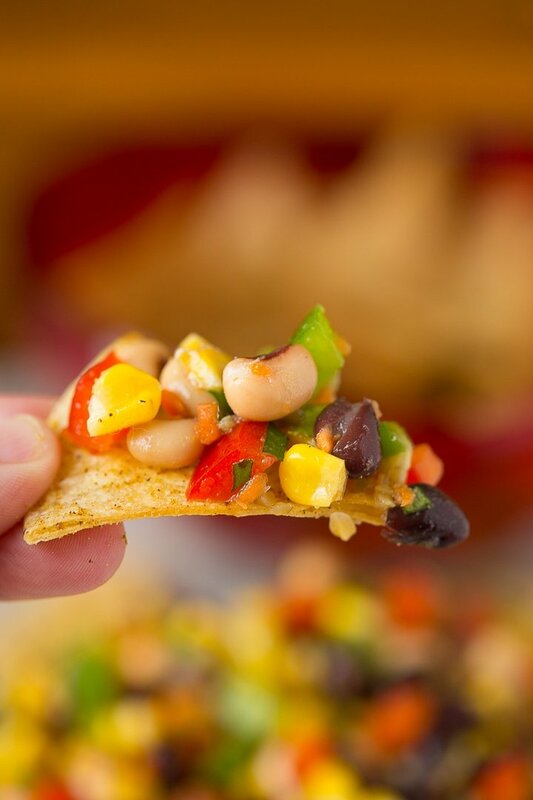 So this black-eyed pea dip. It really is phenomenal. Spiced with paprika, cumin, garlic, cilantro, and salt this really is one that you’ll add to the list of things to make for parties or picnics. I’m always looking to bring healthy snack recipes to larger gatherings and parties because they are always overloaded with sauce laden chicken wings, bleu cheese bedazzled buffalo chicken all sorts of things, and gallons and gallons of bloating, bubbling beer. I love to stuff my face just like everyone else, but I don’t want to go home feeling guilty about the day. 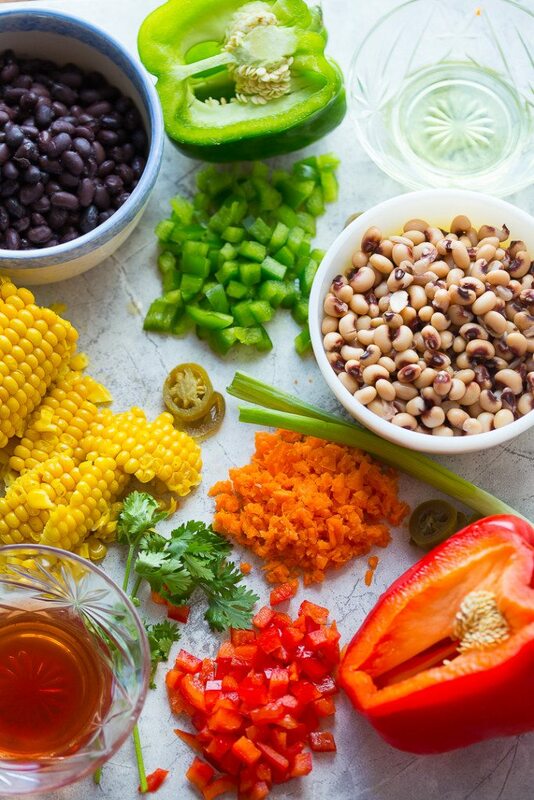 I’d much rather know I noshed on a mound of veggie laden dip with a handful of homemade corn chips rather than eating nothing other than unhealthy (albeit delicious) football food. This recipe also pulls together quickly and you can make it either the night before (the preferred method) or right before you head out the door. 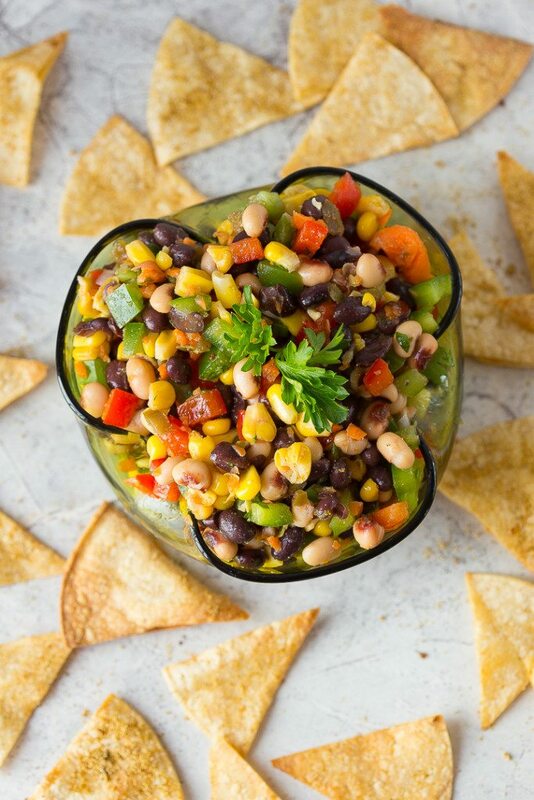 Allowing the flavors to mingle and marry is what takes this Texas caviar over the top but, if you’re anything like me, there’s no way it’ll last overnight in the fridge because you’ll continually head to the fridge to “just give it a taste” and before you know it, the whole bowl is gone. 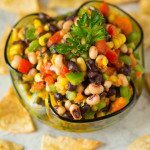 Crunchy, salty, savory and sweet, this Texas Caviar Blackeyed Pea Dip is an awesome healthy snack food that's perfect for tailgating, football or superbowl parties, camping, or picnics! In a large bowl, whisk together red wine vinegar, cumin, sugar, paprika, garlic powder, salt & pepper. Slowly drizzle in the olive oil until well combined. Add the remaining fresh veggies and herbs directly on top of the dressing and toss to coat.